Visiting the site of the previous destruction for the Avengers filming I found that just like all movie magic, the props were gone, the street rubble cleaned up and the destroyed cars non-existent. Gone too were the passionate movie set “bouncers” controlling the crowds. But moving further down the street we found a smaller section of streets still active with movie-making activity. One unplanned prime vantage point was from the parking garage. Surprisingly I was able to park in the lot arked “extras” and the view from the 3rd floor deck was perfect for viewing one of the side streets still filled with movie equipment. Unfortunately timing is everything and the only action taking place was by the crews moving rubble & props around. We then moved on to street level, as far as the barricades would allow, only to find it was 1:00 and except for a few crew members watching the set, they were at lunch, At least one thing is predictable with movie-making, lunchtime seems to be non-negotiable. We found a perfect viewing spot to eat our lunch and had a front row seat (spectator seating is rare) to what was to be the smashing of a fully operational hot dog cart by a large plate of steel, the kind used for covering construction holes in the pavement. Eventually my friend had to go back to work, but would be able to see the action from high above the street. Since it was evident that the only immediate action was from spectators waiting patiently for the slightest bit of movie-making, I decided to walk to Public Square. I wanted to see if I could catch a glimpse of the German village (Stuttgart) that had been filmed the day before. Again, quite surprising that there was not one leftover German sign, facade or discarded prop. It was as if nothing had ever happened there, except that the road was still blocked and crews were putting back up the traditional American street signs. Time to head back to 9th Street to see if anything had progressed on the hot dog cart. Knowing from experience that the best viewing spot usually gets cleared just prior to filming, I opted for another spot at the end of the street, in full view of the smashing, but not close enough to be cleared before the action takes place. I watched as they raised up a giant lighting screen, brought the extras out to the street and gave instructions to the stunt men. There was some action with the stunt men practicing their surprised reactions at the impending smash, and a run-through of running from the scene. Then more waiting. Passing the time with fellow members of the crowd is something you learn to do waiting for the action on set to take place. I talked with a couple from Texas who happened to be in Cleveland for a week and they told of their tales of watching the filming and hearing of star sightings. Scarlett Johansson was seen at a Karaoke bar of all places. Who knew we had such things? And another star from the film was spotted at Put-in-Bay (there had been some filming in Sandusky.) They watched the extras come and go from the courthouse building on Lakeside during a night shoot and caught a glimpse through the bushes of a star in the Stuttgart scene on Public Square. Now back to the waiting…lighting appeared to be a factor, you could see the light levels being tested and still photographs being taken. Then the group photos started taking place. It was apparent that this was the last scene for the Cleveland shoot and everyone involved in the filming was getting into photographs with the director. There was even a fake baby wrapped in a blanket as a prop in the photos. My new Texan friends speculated that the baby represented the film as their “baby” and it being wrapped as “it’s a wrap”. Interesting. But still waiting for the big crash of the hot dog cart. By now it’s 4:10 and I needed to be somewhere else very soon. Another lesson, the set can look like the action is about to take place any minute, but it could be hours away. Waiting until the last minute, I think it will happen just as I walk away, but, much to my disappointment, I didn’t get to see the big event or even hear it as I was walking to the parking garage. I did hear from my friend, high atop the action, that it occurred at 5:00. 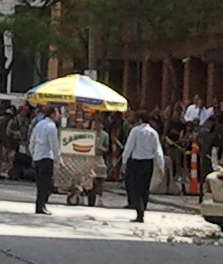 I will have to wait for the May 4 release of the film to see the hot dog cart meet it’s demise.